London: Harsha Dehejia, a practicing physician and well known scholar of ancient Indian culture and Hindu aesthetics who teaches at Carleton University in Canada, recently published his latest work: Rasikapriya: Ritikavya of Keshavdas in Ateliers of Love. This book brings together, for the first time, the full translation of the text in English and includes more than 470 illustrations of paintings related to it. The rasikapriya is one of the main texts of mannered poetry, or ritikavya, which was composed by Keshavdas during the 17th century. Keshavdas was the court poet of Raja Indrajit of Orchha in Bundelkhand. The poet created short verses dedicated to and inspired by love, to which musicians and dancers at the court would respond in their own artistic ways. In addition, many artists produced beautiful miniature paintings to illustrate his words, which now enjoy pride of place in private and museum collections worldwide. Some of Dehejia’s previous publications include The Advaita of Art, Parvatidarpana, Despair and Modernity, Leaves of the Pipal Tree, Parvati Goddess of Love, The Lotus And The Flute: Romantic Moments in Poetry and Painting, Celebrating Krishna: Sensuous Images and Sacred Words, and A Celebration Of Love: The Romantic Heroine in the Indian Arts. 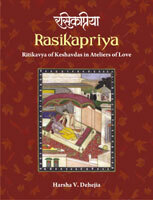 Like the rest of these books, Rasikapriya is definitely a ‘must read’, both for its literary and artistic value.